I decided to dedicate an entirely different article to this topic due to its importance. And in order to be able to use colors in a correct and accurate manner, according to the context, we must at first understand the logic that lies behind them. 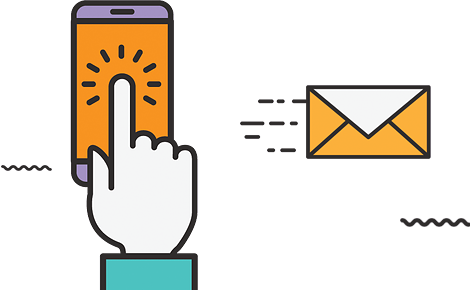 Though it might seem a bit off topic, just think about how you will create your next newsletter or your next email or even web page, why not, without understanding some basic design concepts? Let’s begin with the color wheel. This mainly evolves around blue, red and yellow. Hence, we call them primary colors. This means that we cannot get these colors by combining any other colors between them. Then we have secondary colors, such as green, orange and purple. These we can get by combining the primary colors we mentioned before. And finally we have tertiary colors, such as red-orange, red-purple and so on. These are obtained by combining a primary color and a secondary one. Now we covered mostly everything you can spot in the color wheel. We started our focus with blue because studies show that it is generally, the preferred color of people, both male and female. Yes, over 50% of the population would say blue is their favorite color. It is somewhat interesting, since blue is a cold color, can be found in water, oceans and lately it became an emblem for corporate logos. And yet somehow it lacks the same strength that red has. However, blue stands as a mark for loyalty, trust and understanding. Also, unlike red, it is considered to slow down the pulse, having a calming effect. Another fun fact is that 53% of the flags worldwide contain blue. Hence, by using blue you can’t go wrong. However instead of just making your whole website or email blue (and giving people the blues) try to combine it with another color, for creative effects. Think of Samsung, HP, PayPal, Ford, Dell, Intel and finally, Facebook. Looks quite blue, right? Moving on to the second primary color, yellow. Ironically, it is not red that captures most of the attention but yellow, the most luminous color from the wheel. It stands for joy, happiness, cheerfulness and overall optimism. So you can use it if you want to be instantly seen, also if you want to raise someone’s confidence, spirits and provide inspiration. However, don’t over-yellow anything since at a certain point it is known to cause anxiety. Just like the sunshine, it’s nice but it can blind you. Think of McDonalds, Shell, Lays, Nikon, Subway, DHL, Ferrari and IKEA; using yellow with red, blue or even black. Lastly but not the least, the powerful color red. Also known as the color of extremes, it can stand for passion, love but also danger and violence. Red captures attention, next in line to yellow. Hence, use red if you want to catch one’s eye real fast, make them think of movement, action, dynamism. Think of CNN, Netflix, Puma, Coca Cola, Nissan and Suzuki. A combination between red and white or red and black. Green stands for harmony and balance. Also, the color of nature, trees, forests, mountains. Leads us to think or what is right, since red is an international color for stop and green for go. Green stands for health, rest and is a stress reliever. And we all know the expression of “going green”, which came to existence because of green’s obvious connection with nature and a natural and healthy lifestyle. Think of Spotify, Starbuck, BP, Heineken, Carlsberg. It is used mostly in a combination with either yellow or white. The least favorite color of men. Also stands for spirituality and imagination. Think of the galaxy and universe, usually shown in shades of purple. It is usually used to show luxury, courage and also leaves room for mystery. Think of Hallmark, Yahoo, FedEx and my favorite, Milka. Once again, mostly used with black or white. Probably the most interesting of all, since it combines the power red hold and the friendliness and positivity of yellow. Hence it has motivational powers, it inspires energy and a sense of freedom. Let’s take a look at certain orange famous logos, such as FedEx, Continental, Master Card, Shell, Thomson Reuters and Harley Davidson. They used a combination of either orange and white or orange and black. And if you come to think of it, who would buy a Harley Davidson that is not into a certain rugged sense of independence? Therefore we can see how colors might have a strong influence on how we perceive things, on how we relate to them. Certain colors bring out unknown psychological reaction that we might even be unaware of. Knowing these, we can go further and discuss how we can use colors, their combination and the psychology that lies behind them in order to create better marketing strategies and in order to create a stronger brand for our company. How can you creatively use colors in your marketing strategy?